Are you on the hunt for a new toy for your little one, hoping to find something educational? Ever thought about the benefits of a music toy? Music is an important part of a child’s development. It boosts confidence, helps them develop their language, and overall, it’s fun! For younger children, you don’t need to purchase the latest guitar — for now, toys will do just fine. That’s why I’ve put together this list of the best music toys for babies and toddlers. But first, let’s look at the benefits of music. Use the links above to check the latest prices or read our in-depth kids music toy reviews below. Research shows that music has several benefits for a child’s development. It can help children learn other subjects easier, as it enhances various skills they can use elsewhere (source). Below are just two good reasons why you should buy a musical toy for your little one. For younger children, music is most beneficial when it comes to language development. Every child has the ability to decipher sounds and words, but it’s our job to help and encourage them. If we incorporate music, we can support these natural abilities. Letting your little one grow up in a musically rich environment will help them reinforce and practice their developing skills. This doesn’t necessarily mean that your toddler should take piano lessons already. But playing songs at home and encouraging them to clap along is more than enough. One interesting study found that people who are involved with music have increased neural activity, meaning that their brain works harder. The same goes for young children and those who are learning to play an instrument (source). When looking for a musical toy for your child, you’ll probably notice there are endless options. You want something that’s fun yet durable with a good sound and, most importantly, educational. Finding a toy that can keep your child entertained for hours is important. I don’t know how many times I’ve bought something for my kiddie that just ended up at the bottom of the toy box, never to be touched again. That’s why I always consider the fun element in my search for new toys. It doesn’t necessarily have to be something with lots of colors. But maybe there are hidden components or features, so your little one can discover something new every time. As well as being entertaining, you want something that can withstand the wear and tear of regular use by babies and toddlers. Spending money on something that will break the moment they accidentally-on-purpose drop it is no fun. In fact, it can be so frustrating that you might have to scream into a pillow. This is important when it comes to musical toys. Perhaps your baby won’t care if the sound is a bit scratchy, but you sure will. And while we’re on the subject of sound, a good extra feature would be a volume control. Early hearing damage is on the rise in today’s world, and a loud toy can be one of the culprits (source). Giving your little one a toy that serves some sort of educational purpose is always a great confidence booster for mom, too. 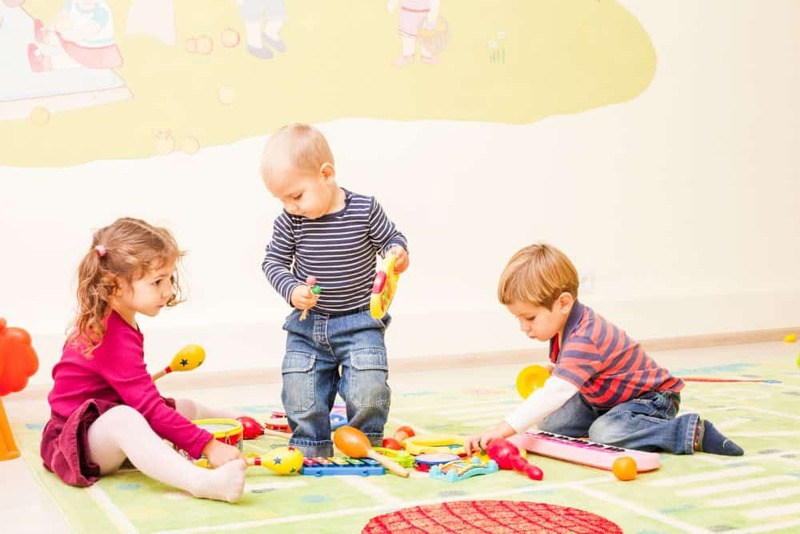 These toys basically help develop some natural skills that your child already has and enables them to learn more. Now that we’ve learned a little about how music can be beneficial to a child’s development, the time has come to discover some music toys. I’ve put together this humble list featuring 11 of the best products I could find. If your little one enjoys being creative and playing with different sounds, the Kidistudio by VTech is a great option. Designed for children aged three to six, this toy studio lets your kiddie record and playback their very own tunes. It features a small piano and a microphone with a voice changer. Additionally, there are over 40 songs and sound effects to play around with. Here, your little one can choose between different genres, like jazz, techno, and rock ‘n’ roll. The light-up keyboard is a nice touch, to keep the wow factor going. This sounds like something I want to play with! However, it can get a bit loud. There’s a volume control, but one that your child could easily turn up. 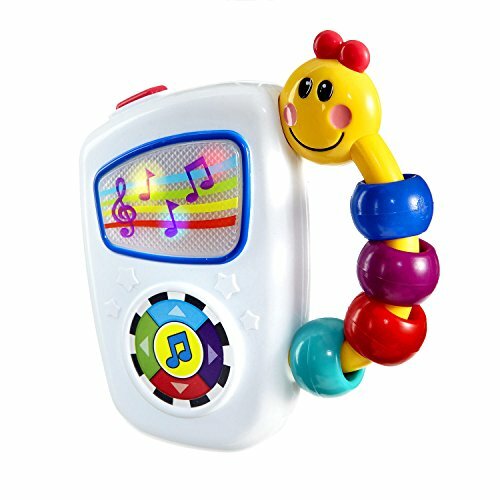 This take-along musical tunes toy from Baby Einstein is perfect for both babies and small toddlers. It’s small in size, making it excellent for little hands to get a good hold of. Take music with you wherever you go with this great little toy that’s popular with lots of moms I know. It looks like a toy phone, but with a large handle fitted with some rattles. When your little one is playing, they can choose between seven melodies. There’s also a small “screen,” fitted with lights that flash as the melodies play. What I love about this toy, other than the stimulating features, is the volume control. These toys tend to get loud, but this can reduce the noise a bit. However, be aware that the color on the rattles can wear off over time. Some moms suggest that you wipe it with a wet towel a few times before giving it to your child. This musical cube from Munchkin has hit the nail on the head. It’s durable and fun for small babies to play with, and it’s even useful when they enter their toddler years. The cube features four large buttons that will teach your little one how sounds combine. The tunes will ultimately create Mozart masterpieces. It can play different sounds from various instruments, such as a French horn, piano, flute, and harp. And as a bonus for us, there’s a volume switch for when it gets too loud. However, some moms do report that it can get tiring listening to the same tunes over and over. With only eight different tunes, it can get repetitive. If you’re looking for a stimulating guitar toy for your little one, I can only recommend this musical guitar from Think Gizmos. 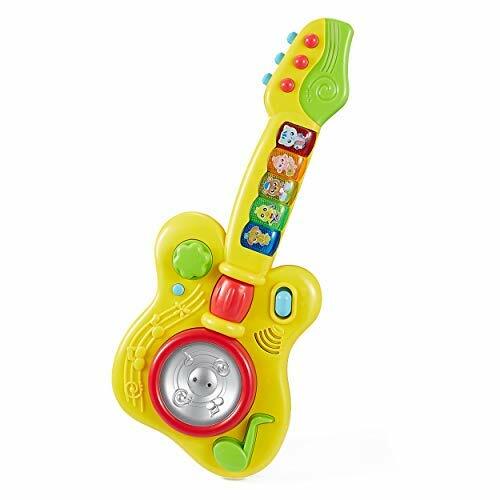 This toy guitar is lightweight yet durable, perfect for the music-loving toddler. It features three different modes, consisting of piano sounds, animal sounds, and a play mode. Your little one can choose to listen to different guitar sounds as well. One really cool feature is the motion activated section on the base of the guitar. Here, your toddler can move their hands across and it will mimic a real strum. However, it can be a bit loud since it only has one volume setting. Drums are excellent for many things. 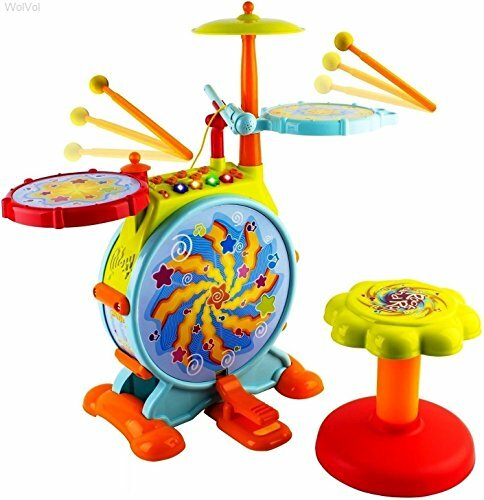 But the reason why I love the KidiBeats drum set from VTech is that it helps children’s sensory development. It features three drum pads and a cymbal, all with their own sound. Your toddler can learn letters, numbers, or play freestyle. It comes with nine preset melodies in different styles, such as pop, rock, and dance. The drum pads also have built-in LED lights that flash. My little one loves drums, and these were an instant favorite. It took some time to get used to the start button that you have to press every time. But other than that, it was great. OK, so I know this isn’t just a piano, but for babies and toddlers, it has lots of great features. 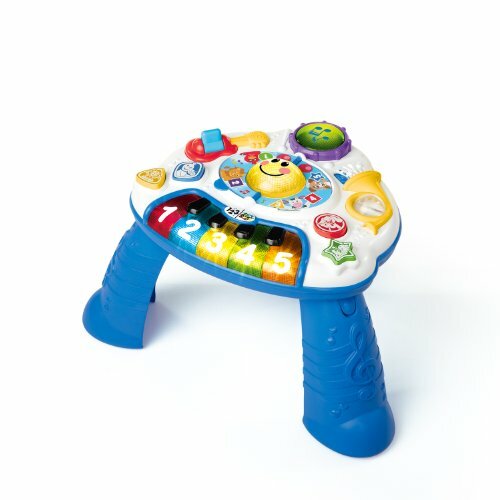 This music activity board from Baby Einstein is another great example of a fun, educational toy for children. This standalone piano features different sounds, such as drums and a French horn. 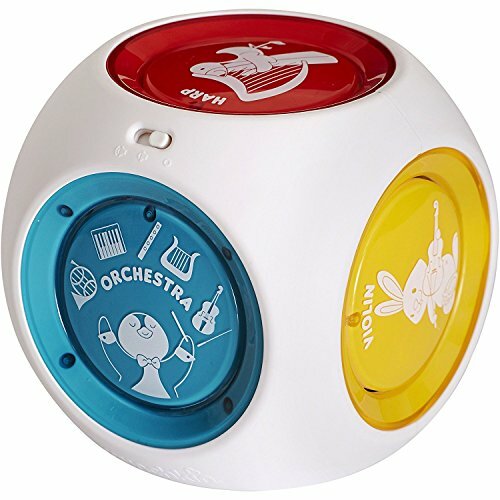 The toy itself encourages your little one to compose their own music. The piano keys feature both numbers and letters. And as a bonus, you have a choice between three languages — English, Spanish, and French. You can also remove the legs and place it on your toddler’s lap, or on the floor. But if you do decide to use it as a table, make sure it’s secured. Place it on a mat or carpet to prevent slipping. This musical activity cube from WolVol will undoubtedly keep your little one busy for hours. It features a huge range of activities for learning and developing. It has a magic mirror where cute animations will appear. A built-in microphone lets your child sing to the tunes where a small animal shows up on the mirror. Looking around the cube, you will also find a detachable phone and a steering wheel with motor functions. As your little one plays, it makes driving sounds. This toy will stimulate different senses in a musical way. Still, before you hand it over, give all the different features a gentle tug. Some moms reported pieces coming apart, but this is uncommon. This is a bit different from the rest. But my little one just didn’t let me pass by this Otamatone musical toy instrument from Cube. She absolutely loves this unicorn edition, so I had to include it. This is a toy version of a Japanese Otamatone instrument. It creates a fun and silly way of creating some catchy tunes. Your little one can play by sliding their fingers along the stem. The higher you slide your fingers, the higher the tone. Although this is fun for toddlers, it’s not something for children younger than two years. It might take them some time to get used it, but it does leave room for creativity. 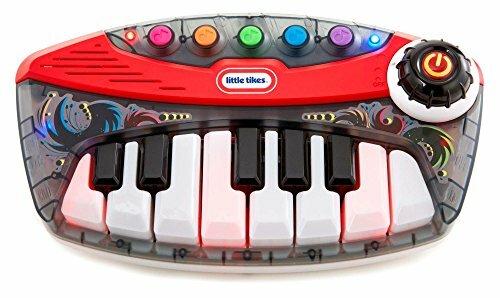 This PopTunes piano from Little Tikes is perfect for toddler boys who just want to rock away. It has all the potential of keeping them entertained for hours. The piano itself features plenty of flashy LED lights. This new updated version comes in a grey translucent color. All the keys are there, both highs and lows, and they do function. Here your little rockstar can choose between preset tunes or going freestyle. However, some moms report that the lights can get overwhelming after a while. 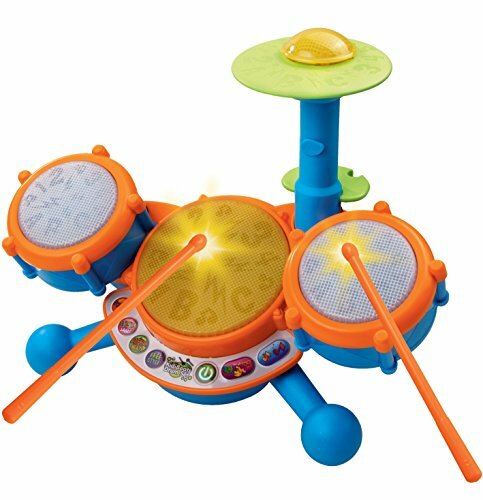 This drum set from WolVol is excellent for growing toddlers. It has all of the fun elements, such as a microphone, bass drum, hi-hats, and even a pedal and sticks. 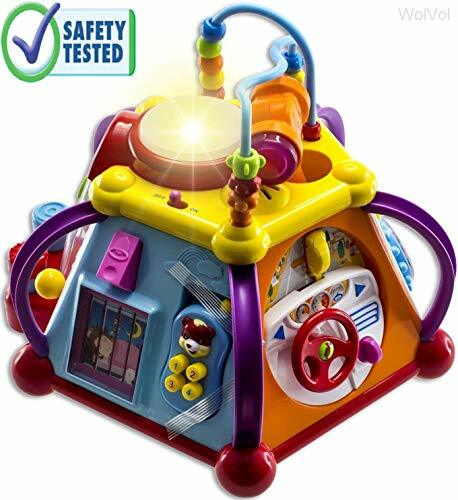 It features different melodies, songs, drum beats, and lots of fun lights. The best feature is its durability. Your munchkin has to be super strong to break this toy! The height of the set is about 24 inches. Your little one will also get a small stool of about 8 inches. Just watch out for the stool as it can be a bit unsteady; some moms suggest that you place it up against the wall. I don’t know about you, but I haven’t come across a child who didn’t love a piano mat. This mat from Click N’ Play is fantastic and fun to look at while also providing some excellent tunes. 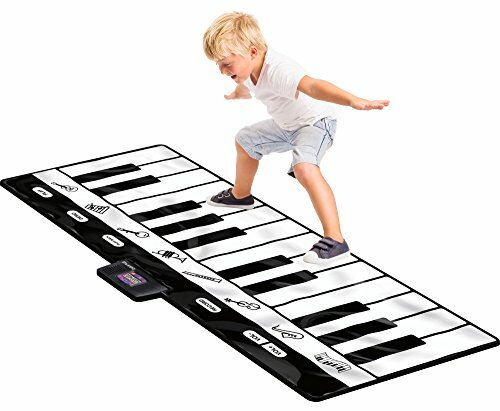 The mat features 24 black and white, heavy-duty keyboard keys that can play various instrumental sounds. Your child can choose between eight different sounds such as guitar, saxophone, violin, banjo, and more. The mat is long and wide, so there’s plenty of room to get wild. The volume is adjustable, but if your little one steps in the wrong place it can get too loud. A few moms did complain that the volume was just too much in general. Musical toys for babies and toddlers are, without a doubt, a good investment. Music has many benefits for a child’s development. However, just make sure you buy something for your kiddo that’s both durable and fun. This is why I’ll mention our favorite one more time. The VTech Record & Learn KidiStudio is perfect for both babies and toddlers — there’s so much for them to do and it’ll keep them busy for hours! 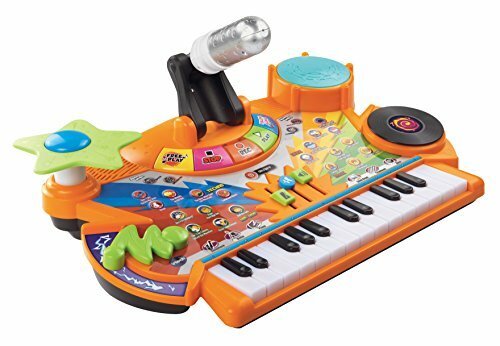 Did you find a music toy for your little one? Do you have a favorite that we missed? Please let us know in the comments below and share if you found this list helpful.